The slick wrist shot that Jack Eichel buried in the Calgary Flames’ net on Wednesday was more than just a game-winning goal. Not only did the overtime tally bust a three-game losing skid for Eichel’s Buffalo Sabres, it also ended a five-game scoring drought for the 22-year-old centre. This season has held a series of highs and lows for the Sabres. A 10-game win streak in November tied a franchise record, but the squad has since struggled to string together victories. The Sabres entered Friday night’s action two points out of a playoff spot. “During that 10-game streak, it seemed like all the bounces were going our way. And as of late, it seems like all the bounces are going the opposite way. That’s hockey. And you just kind of have to deal with it,” said Eichel, the team’s captain. The native of North Chelmsford, Mass., has put up 16 goals and 35 assists this season. Eichel is just the fifth player in the club’s history to put up at least 50 points in his first four NHL seasons, and he’s on pace to beat his career record of 64 points, set last year. But Eichel faced a bit of personal adversity earlier this month with a season-high five-game scoring skid. An upper-body injury compounded the issue, forcing him to miss three games. Sabres coach Phil Housley said the slump was a burden on the former NCAA player of the year. “Sometimes that can get the best of him, trying to do to much and just trying to keep the game simple,” the coach said. 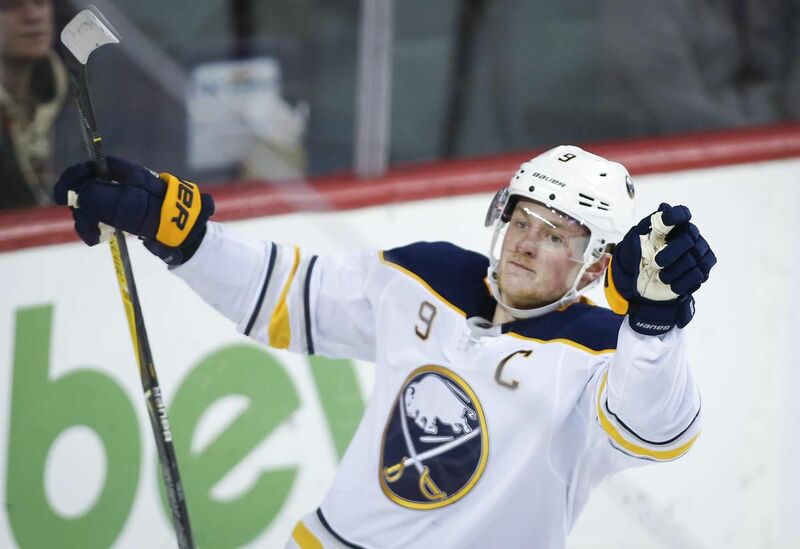 Eichel’s line — which includes wingers Sam Reinhart of West Vancouver and Jeff Skinner of Toronto — has scored more than 40 per cent of Buffalo’s goals this season. Part of that success comes from a strong off-ice chemistry, said Reinhart, who used to live with Eichel and still spends a lot of time with him, reviewing video and watching hockey. “I think that’s the most important thing, reading off each other and kind of being predictable to each other,” Reinhart said. Having a linemate with so much skill doesn’t hurt, he added. “He’s a top-10 player in the league, in the world. So both as a linemate and a teammate, he’s going to drive both,” Reinhart said. Eichel was taken second overall in the 2015 NHL draft, right behind Edmonton Oilers captain Connor McDavid. That kind of talent is hard for other teams to defend, said Skinner. “They have to respect his speed, they have to respect his skill and they have to close on him,” said the winger, who was traded to the Sabres from the Carolina Hurricanes in August. Eichel’s also a consummate leader, both in the locker-room and on the ice, Skinner said. “He’s real competitive. He brings that sort of fire to our locker room. Guys feed off that and I think that’s a real positive thing for our group,” he said. Leading isn’t always easy in the face of adversity, Eichel admitted. This season has provided chances for the team to see that it can handle challenges and continue to grow as a group, Eichel added. “I think it’s a good opportunity for our group to get closer and just stick together and know that nobody’s going to change anything other than the guys in the room,” he said.